Recently, while on a trip out west, (I’m a Southern Girl), my husband shared his experience with “surrendering to the ministry.” We didn’t realize when he shared this phrase that it was unusual to ministry friends in another part of the country. They jokingly said things like, “You surrendered? !” and put their arms up above their heads–revealing the idea that this made being a minister sound like the death of the good life. How awful, right? We all got a good laugh. I mean, they were right. We had just never thought about it that way before. Stephen and I still laugh about it. The friends who kidded us are some of the most trusted, sacred, and wonderful people we’ve ever known. It reminded us, though, that our words matter. We often become so accustomed to certain phrases, slang, and lingo that we forget how these same words or phrases land with others. We had heard “surrender to the ministry” our whole lives in the walls of our churches, so it sounded totally normal to us. With this in mind, I looked up the word “surrender” for us. 1. to yield (something) to the possession or power of another; deliver up possession on demand or under duress. 2. to give (oneself) up, as to the police. 3. to give (oneself) up to some influence, course, emotion, etc. : He surrendered himself to a life of hardship. 4. to give up, abandon, or relinquish (comfort, hope, etc.). 5. to yield or resign (an office, privilege, etc.) in favor of another. 6. to give oneself up, as into the power of another; submit or yield. The choice to surrender continues to be a part of my own journey. 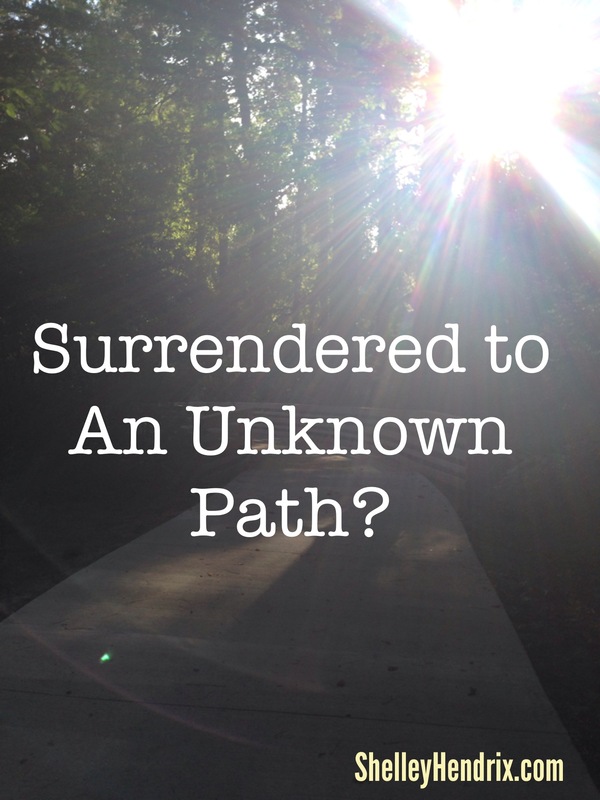 I’ve learned as a follower of Jesus that surrender is not a one-time-call-it-done experience. Surrender is only a “bad” thing when I forget (or don’t understand) its purpose within the context of relationship to God. Sometimes I think I need to know WHAT I’m surrendering to: the ministry, my vocation, financial status, size of platform as a writer, role in the body of Christ, etc. But the truth is, I only need to know to WHOM I surrender. When I get this right, everything else falls peacefully into place. I can then live with purpose, and without all the pressure! You are reading this, most likely, because words matter to you, too. I want to encourage you to pause today, and perhaps from time to time throughout the week, to write down and reflect upon the attributes of the One to whom you have chosen to surrender. Rather than focusing on our platforms, or even the next project, let’s take time to engage fully with the One to whom we choose, once again, to surrender. This entry was posted in Devotion, Encouragement, Writing and tagged ministry, Shelley Hendrix, Surrender, surrender to God, WordServe, Writer's Life, writing by shelleyhendrix. Bookmark the permalink. Thought provoking, Shelley. I am going to take time to write down and meditate on the attributes of my Lord…..praying and lifting hands high in surrender to a KNOWN God. Thank you for sharing your thoughts, Cheryl. You are an encouragement!